Cell lines represent a key tool in cancer research allowing the generation of neoplasias which resemble initial tumours in in-vivo animal models. The characterisation of early tumour development is of major interest in order to evaluate the efficacy of therapeutic agents. Magnetic resonance imaging (MRI) based in-vivo characterisation allows visualisation and characterisation of tumour development in early stages prior to manual palpation. Contrast agents for MRI such as superparamagnetic iron oxide nanoparticles (SPIOs) and manganese chloride (MnCl2) represent powerful tools for the in-vivo characterisation of early stage tumours. In this experimental study, we labelled prostate cancer cells with MnCl2 or SPIOs in vitro and used 1 T MRI for tracing labelled cells in-vitro and 7 T MRI for tracking in an in-vivo animal model. Labelling of prostate cancer cells CT1258 was established in-vitro with MnCl2 and SPIOs. In-vitro detection of labelled cells in an agar phantom was carried out through 1 T MRI while in-vivo detection was performed using 7 T MRI after subcutaneous (s.c.) injection of labelled cells into NOD-Scid mice (n = 20). The animals were scanned in regular intervals until euthanization. The respective tumour volumes were analysed and corresponding tumour masses were subjected to histologic examination. MnCl2 in-vitro labelling resulted in no significant metabolic effects on proliferation and cell vitality. In-vitro detection-limit accounted 105 cells for MnCl2 as well as for SPIOs labelling. In-vivo 7 T MRI scans allowed detection of 103 and 104 cells. In-vivo MnCl2 labelled cells were detectable from days 4–16 while SPIO labelling allowed detection until 4 days after s.c. injection. MnCl2 labelled cells were highly tumourigenic in NOD-Scid mice and the tumour volume development was characterised in a time dependent manner. The amount of injected cells correlated with tumour size development and disease progression. Histological analysis of the induced tumour masses demonstrated characteristic morphologies of prostate adenocarcinoma. To the best of our knowledge, this is the first study reporting direct in-vitro MnCl2 labelling and 7 T based in-vivo MRI tracing of cancer cells in a model of prostate cancer. MnCl2 labelling was found to be suitable for in-vivo tracing allowing long detection periods. The labelled cells kept their highly tumourigenic potential in-vivo. Tumour volume development was visualised prior to manual palpation allowing tumour characterisation in early stages of the disease. Prostate cancer is the second most common form of cancer and the sixth leading cause of cancer deaths among males worldwide [1, 2]. During the last decade, several human prostate cancer cell lines were established and of these, DU 145, LNCaP and PC-3 represent the most prevalent lines [3–5]. In contrast to humans, in animals occurrence of prostate cancer is uncommon. In larger non-human mammalians, only the dog is known to develop prostatic cancer with considerable numbers. Canine prostate cancer shares many characteristics with its human counterpart regarding its clinical presentation and pathogenesis. These characteristics include high grade prostatic intraepithelial neoplasia (PIN) which represents the most common precursor of human prostate cancers [6–8], as well as the metastatic pattern and increased incidence with age [6, 9, 10]. Nevertheless, unlike the human form, canine prostate cancer is an uncommon neoplasm  which does not appear to respond to androgen deprivation , and most canine prostate cancers do not express the androgen receptor . The prognosis is poor due to late diagnosis and treatment options remain palliative in most cases. Nevertheless, the dog displays a unique model of prostate cancer and the characterisation of therapeutic approaches could be of benefit for human as well as for veterinarian patients. Currently, five canine prostate cancer cell lines have been published including CPA 1, CT1258, DPC-I, Ace-1, and Leo [13–18]. Until now, the histological type, the karyotype and the in vivo behaviour of the CT1258 cell line, which was shown to be highly tumourigenic, were characterised [13, 14]. Thereby, the induced tumours mimicked histopathologic and cytogenetic characteristics of the original tumour . In terms of experimental comparability, this study aimed at the controlled delivery of CT1258 cells and early in vivo characterisation of tumour development without the need of sacrificing animals. The in vivo localisation, migrative behaviour and progression of the tumour growth after injection of CT1258 cells were monitored in regular time periods via 7 T MRI. Thereby, the cells were labelled in vitro with the MRI contrast agents manganese chloride (MnCl2) and superparamagnetic iron oxide nanoparticles (SPIOs). Iron oxide nanoparticles are widely used as MRI contrast agents. Scientific and clinical applications include the tracking of labelled transplanted stem cells in neurological and cardiovascular diseases as well as diagnostic imaging of liver and spleen for tumour detection and staging [19–23]. In prostate cancer, labelling of the human cell line PC-3 with lipid-coated SPIOs has been reported  and in vitro labelling with micron sized iron oxide nanoparticles (MPIOs) and subsequent in vivo tracing via MRI was performed in the rodent prostate cancer cell line TRAMPC1 . In contrast, the use of MnCl2 for cell labelling and non-invasive in vivo cell tracing is much less common. In most cases, manganese-enhanced MRI (MEMRI) has been used in studies of the anatomy and function of the central nervous system and the heart after systemic administration of manganese [26–29]. So far, in vitro labelling of cells with MnCl2 for MR imaging was performed in murine pancreatic beta cells, human lymphocytes, embryonic stem cells and bone marrow stromal cells [23, 30–33]. The manganese agent Mn (III)-transferrin was used for labelling and in vivo detection of murine hepatocytes . The use of manganese oxide (MnO) for in vitro cell labelling was evaluated in human cell lines including a prostate adenocarcinoma cell line. Labelling with MnO and subsequent MRI-based in vivo tracking has been carried out in rat glioma cells [35, 36]. The aim of the present study was to evaluate appropriate labelling parameters which enable MR imaging of cells with MnCl2 and SPIOs, in a CT1258-based in vivo model of canine prostate cancer. This is the first study, reporting direct in vitro cell labelling with MnCl2 and subsequent MRI-based in vivo tracing of prostate cancer cells. This technique enables a time-dependent characterisation of tumour development in regard to tumour size prior to manual palpation in early stages of the disease. Cell viability was analysed 24 h after the labelling reactions. Labelling for 1.5 h with 0.02 M to 0.04 M MnCl2 revealed the percentages of living cells ranging from 91.7% to 23% (tab. 1). The unlabelled control cells revealed 95% of living cells (Table 1). Cells labelled with 0.035 M MnCl2 for different time periods (1.5 h to over night) revealed viability values from 89% to 37% (Table 2). Respective control cells revealed 98% of living cells (tab 2). CT1258 cells were labelled with 0.035 M MnCl2 for different incubation times at 37°C and 5% CO2. After labelling, the cells were further cultivated overnight in culture medium at 37°C and 5% CO2. Cell viability test was performed with Trypane-blue dye. Cell proliferation levels that were measured after labelling with 0.035 M MnCl2 for 1.5 h revealed mean values of 0.09413 for labelled cells and 0.1128 for control cells (mean values were calculated from 16 measurements per group). Statistical t test analysis resulted in a p value of p = 0,008 showing statistical significant difference between both groups. In vitro MRI (1 T) examination of the agar block revealed identical detection limits of 105 cells/well for cells labelled with MnCl2 (T1-weighted sequences; Figure 1 A) and SPIOs (T2/T2*-weighted sequences; Figure 1 B). 1T MRI scan of MnCl 2 and SPIOs labelled cells in a 1% agar phantom. The numbers of labelled cells accounted: 7 × 105, 2.5 × 105, 105, 5 × 104, 2.5 × 104, 104, 5 × 103, 103. As controls 1 × 105 unlabelled cells, the culture medium, 1 M MnCl2, and Endorem solution were used. A: T1 weighted MRI. SPIOs labelled cells (left two lanes), the controls with un-labelled cells and the culture medium showed comparable signals. 1 M MnCl2 solution showed a strong signal enhancement. MnCl2 labelled cells (right two lanes) were detected to a limit of 105 cells. B: T2* weighted MRI scan. MnCl2 labelled cells (right two lanes), the controls, and the culture medium showed comparable signals. Endorem solution showed a strong signal extinction. SPIOs labelled cells (left two lanes) were detected to a limit of 105cells. Based on the previous described in vitro results, we inoculated two NOD-Scid mice with 104 unlabelled cells subcutaneously prior to the MRI contrast in vivo studies. The induced tumours were detectable via manual palpation on day 28 and the animals were sacrificed on day 32 and 40 due to tumour burden. The observed tumour diameters at the scarification date were 10 mm in the respective animals. In the first MRI group (n = 2) of animals, MnCl2 and SPIOs labelled cells were detected in vivo. MnCl2 labelled cells were detected through signal enhancements in T1 weighted MRI on day 1 (Figures 2 A, B; Figure 3 A), day 4 (Figure 3 B) and day 9 (Figure 3 C) after contrast-agent injection. On day 28, a tumour mass was identified in the animal (Figure 3 D). 7T MRI of a male NOD-scid mouse after subcutaneous injection of 10 4 MnCl 2 labelled CT1258 cells. The MRI scans were performed on the same day as the injection (day 1). A: FSE T1 weighted MRI Scan. B: FSE T2 weighted MRI scan. Arrows: localisation of the injected MnCl2 labelled cells in T1 (A) and T2 (B) weighted MRI. In T1 weighted MRI (A) the MnCl2 labelled cells were detected due to a strong signal enhancement. 7T MRI scans of a male NOD-scid mouse after subcutaneous injection of 10 4 SPIOs labelled CT1258 cells. The MRI scans were performed on the same day as the injection (day 1). A: FSE T1 weighted MRI Scan. B: FSE T2 weighted MRI scan. C: FISP T2* weighted MRI scan. Arrows: localisation of the injected SPIOs labelled cells in T1 (A), T2 (B) and T2* (C) weighted MRI. In T2 (B) and T2* (C) weighted MRI the SPIOs labelled cells were detected due to a strong signal extinguishment. 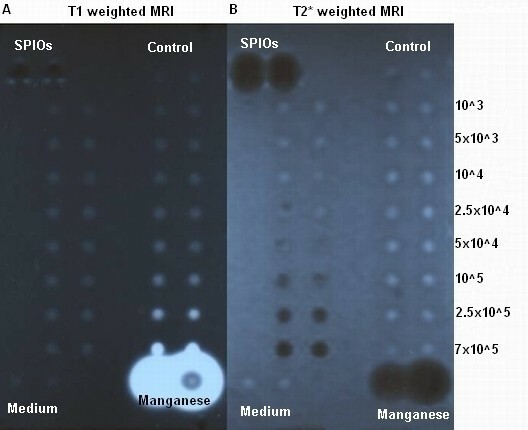 SPIOs labelled cells were detected through signal extinctions in T2/T2* weighted MRI on day 1 (Figures 4 A, B, C; Figure 3 E), and day 4 (Figure 3 F) after contrast-agent injection. On day 9, no signal extinctions were identified and the animal did not show evidence of tumour development (Figure 3 G, H). Within the second group of animals (n = 18), in all animals of the first subgroup (n = 8) MnCl2 labelled cells were detected in T1-weighted MRI on the first day after injection. Due to tumour burden the number of animals available on days 4 and 8 decreased and on day 10 two remaining animals showed slight signal enhancements indicating the location of the injected cells. Tumour development occurred in all animals and these tumours were detected prior to manual palpation through T1 and T2 weighted MRI. In nine animals of the second subgroup (n = 10), MnCl2 labelled cells were detected on the second day after injection. On days 10 and 16, the number of animals decreased to remaining two animals on day 16. In these animals, slight signal enhancements were detected indicating the presence of MnCl2 labelled cells. In five from ten animals, tumours developed which were detected in T1 and T2 weighted MRI prior to manual palpation. 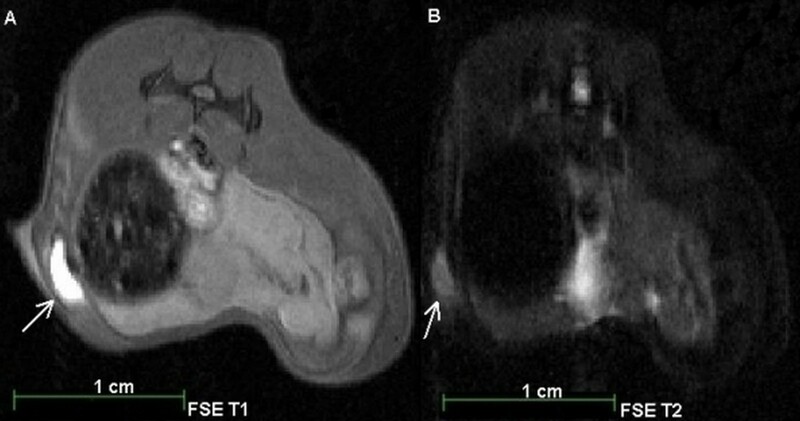 Figure 5 shows a T1 weighted MRI scan of a male animal that developed a tumour at the site of injection 24 days after injection (Figure 5 A). Longitudinal in vivo 7 T MRI scans of two male NOD-scid mice after subcutaneous injection of 10 4 CT1258 cells labelled with either MnCl 2 or SPIOs at the day 1, 4, 9 and 28 after injection. A-D: in vivo MRI scans of an animal which received MnCl2 labelled cells. A: FSE T1 weighted MRI scan on the day of injection (day 1). B: FSE T1 weighted MRI scan on day 4 after injection. C: FSE T1 weighted MRI scan on day 9 after injection. D: FSE T1 weighted MRI scan on day 28 after injection. The MnCl2 labelled cells were not detectable and a tumour mass developed at the site of injection. E-H: in vivo MRI scans of an animal which received SPIOs labelled cells. E: FSE T2 weighted MRI scan on the day of injection (day 1). F: Turbo RARE T2 weighted MRI scan on day 4 after injection. G: Turbo RARE T2 weighted MRI scan on day 9 after injection. The cells were not detected and there were no signs of tumour development. H: FSE T1 weighted MRI scan on day 28 after injection. White arrows: localisation of labelled cells. Red arrow: localisation of the developed tumour at the site of injection. 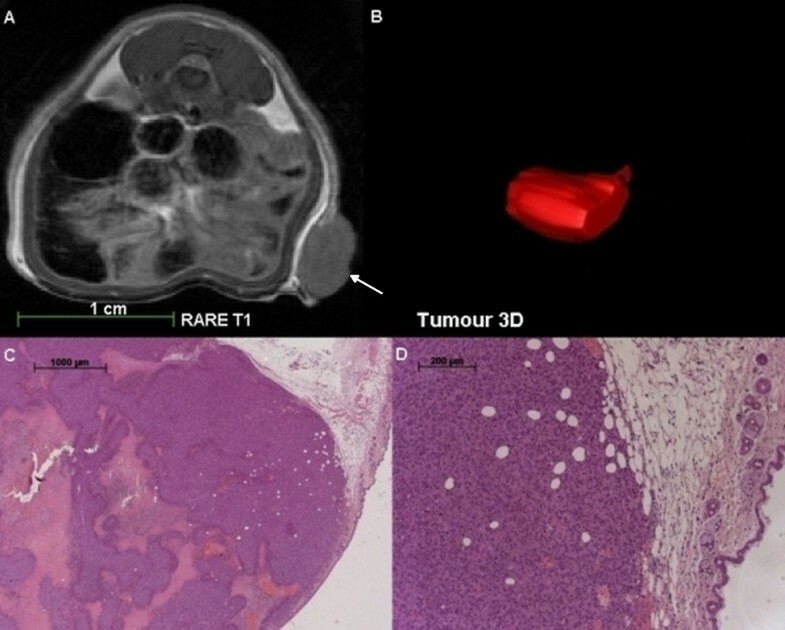 T1 weighted MRI scan, three dimensional reconstruction and histological analyses of a tumour induced by injection of MnCl 2 labelled CT1258 cells into a male NOD-scid mouse. A: RARE T1 weighted in vivo MRI scan 24 days after sc injection of the labelled cells. On the right abdominal flank, a tumour mass developed. No signs of metastasis were detected. B: Three dimensional graphical analysis of the tumour structure 24 days after injection of the labelled cells. C and D: Histological analysis of the obtained tumour mass. The obtained tumour showed the characteristic appearance and morphology of a prostate adenocarcinoma. The analysis displayed pleomorphic cells with a high mitotic index. The centre of the obtained tumour was highly necrotic and the tumour infiltrated into the subcutaneous fat tissue. The tumour developed an incomplete fibrous capsule. White arrow: localisation of the developed tumour at the site of injection. Altogether, in 13 of 18 animals, tumour masses developed at the site of injection. All male animals which had received 104 cells (n = 4) developed tumours (100%) while injection of 103 cells (6 female, 8 male) led to tumour development in 4 female (66%) and 5 male (62.5%) animals. The increment of tumour volumes in [mm3/day] was analysed for each animal and is shown in Tables 3, 4, and 5. The animals were numbered from 1 to 13 and grouped according to their gender and amount of injected cells. Table 3 shows increment of tumour growth in animals 1–4 (4 male; 2 intact, 2 castrated; 104 cells). Table 4 displays increment of tumour growth in animals 5–9 (5 male, 3 intact, 2 castrated, 103 cells). Table 5 presents the increment of tumour volumes in animals 10–13 (4 female, 2 intact, 2 ovariohysterectomised, 103 cells). The male animals received 104 MnCl2 labelled cells. The tumour volumes are displayed for the respective days of MRI measurements after subcutaneous injection. In animal 4, tumour masses developed on the left and right abdominal flanks due to incorrect injection of cells. The male animals received 103 MnCl2 labelled cells. The tumour volumes are displayed for the respective days of MRI measurements after subcutaneous injection. The female animals received 103 MnCl2 CT1258 labelled cells. The tumour volumes are displayed for the respective days of MRI measurements after subcutaneous injection. ♀ = female animal; OHM = Ovariohysterectomised. All tumours were located subcutaneously, were non-adhesive to the surrounding tissue and its diameters varied from 10 to 15 mm. Some tumours developed ulceration while animals showed no signs of metastasis or of invasive tumour growth. Histological analysis of the tumours showed pleomorphic cells with a high mitotic index (Figure 5 C and D). The centres of the obtained tumours were highly necrotic (Figure 5 C). Most of the tumours infiltrated into the subcutaneous fat tissue (Figure 5 D) and some tumours developed an incomplete fibrous capsule. One of the major challenges of this study was the identification of adequate MnCl2 in vitro cell labelling parameters due to the cellular toxicity of MnCl2. We aimed at identifying dosages as low as possible but still high enough to produce a robust MRI contrast. Incubation of approximately 1x107 cells with 0.035 M MnCl2 for 1.5 h was evaluated to be suitable for cell labelling as comparable effects on viability and cell proliferation were observed. The labelling reaction resulted in cell viability of 89–90% and t-test analysis of cell proliferation resulted in a p value of p = 0,008 matching the viability test results. After the labelling reaction, the medium was discarded, and the cells were further cultivated in non-labelled culture medium overnight. This ensured the recovery of cells and removal of residual MnCl2. Prior to in vivo injections, the labelled cells were washed again to ensure that the positive signal enhancement in T1 weighted MRI is generated by the labelled cells and not residual MnCl2 in the injected solution. The labelling parameters reported for human lymphocytes, embryonic stem cells and bone marrow stromal cells differed from the ones of the presented study. Concentrations of labelling MnCl2 solutions reported in the literature range from 0.1 to 0.5 mM and therefore, are lower than the concentration used in our study. The therein reported incubation time spans did not exceed 30 to 60 min and - apart from the lymphocyte study with a cell number of approximately 2.4x107 - the applied absolute cell numbers were lower (3x106) than the cell number applied in the present study [23, 31–33]. The reported labelling reactions were uniformly performed in 0.9% sodium chloride solutions, whereas the labelling reactions within the present study were performed directly in culture medium. This might have led to higher tolerated concentrations of labelling MnCl2 showing no major cytotoxic effects. During our labelling reactions, the respective cells remained in a buffered medium system and were supplied with nutrients in order to ensure their viability. After labelling of the canine CT1258 cells with MnCl2 and SPIOs, an in vitro 1 T MRI pre-study using an agar phantom was performed. In general, agar phantoms share similar MRI characteristics with tissue during MRI. This part of the study was performed to evaluate whether labelled cells are also detectable at low magnetic fields (absolute cell number detection limit) as in most cases of human and veterinary examinations, MRI devices with magnetic field strengths of one to three Tesla are used. Thus, besides the herein generated data for basic research a potential translation into clinical setups was evaluated. Furthermore, the in vitro pre-study allowed a reduction of animal numbers for subsequent in vivo studies. MnCl2 and SPIOs labelled CT1258 cells showed the same in vitro detection limit accounting 1x105 cells. In the literature, lower numbers of SPIO labelled cells have been detected in vitro (as reviewed for example in [20, 37]) while detection of labelled MnCl2 cells was reported for cell numbers exceeding 1x106 using MRI systems with a magnetic field strength of more than 1 T [23, 31–34, 36]. However, it should be considered that within these studies, determination of manganese concentrations or characterisation of relaxation properties represented the primary study goals. In contrast, the evaluation of cell detection thresholds was not a primary objective of these studies. Nevertheless, the results of our study demonstrate that cell numbers lower than those already reported are sufficient for in vitro MRI detection. Within the MRI scans of the first animal group the MnCl2 labelled cells were detectable for a longer time span than SPIOs labelled cells. The MnCl2 labelled cells were locatable until nine days after injection in T1 weighted MRI scans. The cells were not detectable in T2 and T2* weighted MRI scans and this makes false positive interpretation about the position of the cells unlikely. SPIOs labelled cells were detected up to four days after injection in T2 and T2* weighted MRI. On the following days, an exact distinction of cells and surrounding tissue was not possible. Generally, SPIOs generate a loss of signal on MRI and depending on the localisation, it is difficult, to distinguish the signal voids caused by SPIOs from other sources of hypointense MRI signals such as motion artefacts, susceptibility artefacts, bleeding/hemosiderin, calcification, water-fat interfaces, and air [23, 35, 36]. Thus, we decided to use only MnCl2 for the subsequent in vivo MRI scans in the second group of animals. Moreover, as manganese is transported actively through Ca2+ channels into biologically active cells, MRI enables a correlation between cellular viability and a T1-weighted positive signal . Thus, information about the localisation and survival of administrated cells like in injured myocardium was generated [31–33]. SPIO labelling in contrast, does not provide any biologic information of the labelled cells, as residual SPIOs particles from dead SPIO-labelled cells are also phagocytised non-specifically by macrophages from the surrounding tissue [23, 33]. After death of manganese labelled cells, Mn2+ diffuses passively out of these cells resulting in reduced T1-shortening effect and loss of contrast effect [23, 36]. This was also observed during the present study as the signal intensity of MnCl2 labelled cells decreased (within the first group (n = 2) until 9 days after injection, within the second group (n = 18) until 16 days after injection) in a time dependent manner. In an in vivo study by Chung et al. , MnCl2 labelled human embryonic stem cells (hESC) were detected through 3 T MRI until four to five days after injection. Our scans were performed in a 7 T system which might have led to the detection during longer time periods. However, in most cases, the MnCl2 labelled cells were detected during the first five days comparable to the previously reported findings . Regarding the cell numbers injected (103 and 104), no significant correlation between cell numbers and signal intensity was observed. Within a total of 18 animals which were part of the second group of animals, 13 animals developed tumours which mimicked the natural behaviour of the original tumour. This demonstrates that MnCl2 labelling did not alter the biological activity and characteristics of CT1258 cells. 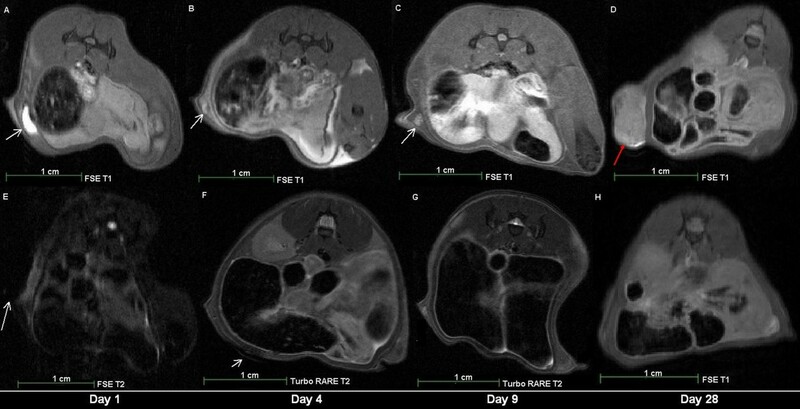 In conventional in vivo studies characterising tumour development in rodent models as the study by Fork et al., the tumour development was analysed via manual palpation whereby the tumours were allowed to grow to a size ranging from 5 to 8 mm which lasted 20 to 42 days after s.c. injection of CT1258 cells . In the present study, the two animals inoculated with unlabeled cells showed comparable results to the Fork study. Due to the use of contrast enhanced 7 T MRI scans, the induced tumours were detected prior to manual palpation and in some cases earlier than 20 days after injection although lower cell numbers were applied. Taken together, the time spans to sacrification of the unlabelled animals and the MRI contrast group were comparable to those of the Fork study. Furthermore, the comparison of the tumours in the male animals showed a correlation between cell number injected and the tumour size and disease progression. Animals of both genders which had received 103 cells, developed tumours after comparable time periods ranging from 17 to 25 days following injections. We did not observe significant gender-dependent and hormone-status dependent effects on tumour size and progression. Consistent with observations by Fork et al. no animal developed metastases which might have been caused by fast tumour progression leading to euthanasia of the animal. Moreover, there seems to be a low disposition of CT1258 cells to metastasise as the primary tumour was obtained from a 10 year old dog which -despite of several small metastases in the mesentery – showed no signs of abnormalities . The histological analysis of the tumour masses showed cells with characteristic appearances and morphologies of a prostate adenocarcinoma, comparable to the findings which were reported during establishment of the cell line [13, 14]. In conclusion, we demonstrate that labelling cells of the prostate cancer cell line CT1258 with MnCl2 and SPIOs represents a feasible method allowing detection through MRI in in vitro and in vivo models. This is the first study reporting MnCl2 labelling and in vivo tracing of prostate cancer cells allowing monitoring of tumour development in early stages in vivo prior to manual palpation. The opportunity to characterise early tumour development and cellular behaviour may be of major interest since it allows evaluation of agents intervening in early stages of in vivo tumour development. Thereby, the contrast enhanced MRI based visualisation allows calculation of actual tumour volumes at different points of time without scarifying the animal (Figure 5). Thus, in addition to a possible significant reduction of animals required for studies, the tumour development can be monitored and described in single individuals reducing inter-individual variance. The MnCl2 labelled prostate cancer cells kept their highly tumourigenic potential in male and female NOD-scid mice indicating that the labelling does not majorly affect the cellular behaviour. Furthermore, histological analyses of the induced tumours showed the same characteristics as described for the original tumour. Consequently, the possible contrast enhanced in vivo visualisation of early tumour stages may be of significant benefit for the evaluation of therapeutic strategies in in vivo animal models used in veterinary and human medicine. The characteristics, cultivation conditions, and a basic in vivo growth pattern were previously described for the canine prostate cell line CT1258 [13, 14]. MnCl2·4H2O (Appli-Chem, Darmstadt, Germany) was dissolved to a concentration of 1 M MnCl2 and sterile-filtered. Aliquots were pipetted into CT1258 cell culture flasks and mixed with the culture medium (Medium 199 (Gibco, Karlsruhe, Germany) 20% heat-inactivated fetal calf serum (PAA Laboratories GmbH, Coelbe, Germany), 200 U/ml penicillin and 200 ng/ml streptomycin (Biochrom AG, Berlin, Germany)) to a final volume of 5 ml. Labelling of the cells was performed with the following MnCl2 concentrations: 0.02 M, 0.025 M, 0.03 M, 0.035 M, 0.04 M, 0.045 M. Incubation was performed for 1.5 h at 37°C and 5% CO2. Cells which were labelled with 0.035 M MnCl2 were also incubated for 3 h, 4 h, 5 h, 6 h and 24 h at 37°C and 5% CO2. After incubation the labelling medium was discarded, the cell layer washed with PBS and the cells further cultivated overnight in culture medium at 37°C and 5% CO2. According to an established protocol, 5x106 cells were transferred in a culture flask with 5 ml culture medium and 41.15 μl Endorem infusion suspension (Guerbet S.A., Roissy, France) according to 130 pg iron oxide nanoparticles per cell. The cells were incubated overnight at 37°C and 5% CO2. Cell staining was performed with 500 μl 0.5% solution of Trypane-blue (Sigma Aldrich, Munich, Germany). The cells were incubated for 10 min at room temperature, the Trypane-blue solution was discarded, the cell layer washed with PBS, the cells trypsinised with 1 ml TrypLE Express (Invitrogen, Karlsruhe, Germany) and the cell number was determined. 5x104 MnCl2 labelled CT1258 cells/well were transferred into a 96 well plate (BD Falcon, Heidelberg, Germany) and incubated for 24 h in 100 μl culture medium at 37°C and 5% CO2. As control, unlabelled cells were co-incubated. Cell proliferation was evaluated using the Cell Proliferation ELISA, BrdU (colorimetric) kit (Roche Diagnostics, Mannheim, Germany) according to the manufacturer’s instructions. The measurements and data analyses were performed with Synergy 2 multi-mode microplate reader and the Gen5TM software (BioTek, Bad Friedrichshall, Germany). A T-test was performed for analysis of the cell proliferation experiments. A 1% agar (Invitrogen, Karlsruhe, Germany) gel solution was filled half-full into a an pipette tip box (Greiner Bio-One, Frickenhausen, Germany) and an unskirted 96 well PCR plate (Eppendorf, Hamburg, Germany) was embedded onto the liquid agar solution, so that sample wells were formed. The labelled cells were trypsinised, the cell number was determined, aliquoted into 1.5 ml reaction tubes (Eppendorf, Hamburg, Germany) and pelleted. The following cell numbers of either MnCl2 or SPIOs labelled cells were used: 7x105, 2.5x105, 105, 5x104, 2.5x104, 104, 5x103, and 103. As controls 1 μl 1 M MnCl2 solution, 1 μl Endorem solution, 105 unlabelled cells and 30 μl culture medium were used. The cell aliquots and controls were mixed with 30 μl hand-warm 4% gelatine solution and the samples were pipetted into the wells of the polymerised agar phantom. The air bubbles were removed. After polymerisation, the phantom was covered with 1% agar gel and air bubbles were removed. The plastic box was removed prior to MRI scans. Prior to the MRI contrast scanning analysis two male NOD.CB17-Prkdc scid /J (in the following NOD-Scid) mice were inoculated with 104 unlabelled CT1258 cells subcutaneously at the abdominal flank. We monitored the tumour growth by regular daily observation and manual palpation. The MRI contrast study involved 20 NOD.CB17-Prkdc scid /J mice (6 female, 14 male). Three female and six male animals were ovariohysterectomised/and castrated, respectively. All animals were bred and maintained in a protected environment at the Central Animal Facility of the Hannover Medical School. Mice were fed autoclaved food and water and any manipulation was performed in a laminar flow hood. The animals were observed daily and euthanisation was carried out if necessary, depending on the clinical condition, tumour size, and occurrence of tumor mass ulceration. The animals were euthanised by exsanguination after inhalation of >70% CO2. The study was approved by the Lower Saxony State Office of Consumer Security and Food Safety (33-42502-05/950). Aliquots of the respective cell number/animal (either 103 or 104 cells) were transferred into 1.5 ml cups. The cells were centrifuged for 10 min at 1,000 rpm and the cell pellet was washed twice with sterile PBS. The cells were resuspended in 200 μl PBS, aspirated into Insulin-Syringes (BD Micro-Fine, BD, Heidelberg, Germany), and injected subcutaneously into the abdominal flank of the respective animals. Altogether 19 animals were inoculated with 103 (6 female, 8 male) or 104 (5 male) MnCl2 labelled cells. One male animal was inoculated with 104 SPIOs labelled cells. Animals were autopsied immediately after euthanasia. Tumour masses were fixed in 4% buffered formalin (pH 7.2) embedded in paraffin. Sections (4 μm thick) were stained with hematoxylin and eosin. The agar phantom was scanned with a 1 T MRI system (Siemens Magnetom Expert, Erlangen, Germany) and data were analysed with dicomPACS version 5.2 (Oehm and Rehbein, Rostock, Germany). T1 weighted MRI scanning parameters were as follows: pulse repetition time (TR) = 330 ms, echo time (TE) = 12 ms, flip angle (FA) = 90°, slice thickness (ST) = 3 mm. T2* weighted MRI scanning parameters were: TR = 800 ms, TE = 26 ms, FA = 20°, ST = 2 mm. In vivo MRI was performed on a 7 T Bruker Pharmascan 70/16 (Bruker Biospin, Ettlingen, Germany) under Paravision 5.0 equipped with a 6 cm Volume Resonator. Anaesthesia of the animals was maintained with a concentration of 1–2% isoflurane and the body temperature was held at approximately 37°C using a temperature control unit (Small Animal Instruments, Stony Brook, NY, USA). The animals were divided into two groups. Within the first group, two males received 104 cells labelled with either MnCl2 or SPIOs subcutaneously into the left abdominal flank. The animals were scanned on day 1, 4, 9, 15 and 28. Although in general RARE and FSE MRI sequences are very similar we have chosen the standard Bruker Turbo-RARE for easy comparison with other groups and a modified FSE Protocol for the detection of our labeled tumour cells. In order to nearly null the signal from the surrounding tissue an Inversion pulse before the normal pulse sequence is applied. The FSE tailored to T2 contrast has decreased scan time allowing for more signal averages and higher resolution. The drawbacks are some edge blurring and brighter fat due to lack of J-coupling. Scan parameters were as follows: Fast Spin Echo (FSE) T1: TR = 1300 ms, TE = 9.5 ms, ST = 1 mm; FSE T2: TR = 2500 ms, TE = 36 ms, 2 echoes; (Turbo-RARE) Rapid Acquisition with Relaxation Enhancement T2: TR = 2500 ms, TE = (eff) 36 ms, 1 echo, ST = 1 mm; T2*: Multi Gradient Echo (MGE) TR = 2000 ms, TE = 9 ms, FA = 30°, ST = 1 mm. The second group contained 18 animals (6 female, 12 male) which received either 103 or 104 MnCl2 labelled cells subcutaneously into the right abdominal flank. The animals were divided into two subgroups. In the first subgroup (n = 8; 4 castrated, 4 intact male mice) the animals were scanned on days 1, 4, 8, 10, 15, 17, 22, 24, and 43. The animals of the second subgroup (n = 10; 3 ovariohysterecotmised, 3 intact female mice, 2 castrated, 2 intact male mice) were scanned on days 2, 10, 16, 23, 25, 39, 47, 53, 60, and 67. Scan parameters were as follows: RARE T1: TR = 1300 ms, TE = 9 ms, ST = 1 mm, Turbo-RARE T2: TR = 2500 ms, TE = (eff) 36 ms, 1 echo, ST = 1 mm. MRI image data were analysed with the ITK-SNAP 2.1.4-rc1 software  (http://www.itksnap.org/). Tumour sizes in [mm3 were determined threefold and the mean value was calculated. Martin Meier contributed equally to this work. The work was funded by the German Research Foundation (DFG) grant 299/9-1 and supported by the cluster of excellence REBIRTH. KAS cell culture work, labelling with MnCl2, viability and cytotoxicity testing, assistance with agar phantom construction, assistance with MRI scans and interpretation of data, analysis of tumour volumes, partial manuscript drafting, MM performed MRI scans and supervised the data analyses, partial manuscript drafting and study design, SG performed castration of mice, autopsy and immunohistochemistry, partial manuscript drafting, MM2 performed the in vivo inoculation of the NOD-Scid mice, SW performed the ironoxide nanoparticle labelling and agar phantom construction, PW performed the in vivo inoculation of the NOD-Scid mice, MD supervised the in vivo work, partial study design, partial manuscript drafting, JB, head of the Centre for Human Genetics Bremen, performed partial study design, HME partial study design, coordination and supervision of cell culture and contrast agent labelling and in vitro work, partial manuscript drafting and finalisation, HJH, head of the Institute of Laboratory Animal Science, performed partial study design, approved the final manuscript, IN incited the study and coordinated the operational procedure, approved the final manuscript. All authors read and approved the final manuscript.